Accordion Cool is the name of Dave's TV show. Due to the success of the show, Dave has incorporated the name to also include his live performances. The name suggests what Dave tries to do in his performing, and that is "make the accordion cool." In that vein, he does not play stereotype accordion. His genre of choice is a light jazz style, featuring the great music of the big band era and old standards. His goal is to bring back pleasant memories through his music. He also includes some fifties, sixties and seventies, a little rock'n roll and some country. There are several videos elsewhere on this sight from Dave's TV show featuring the aforementioned music. 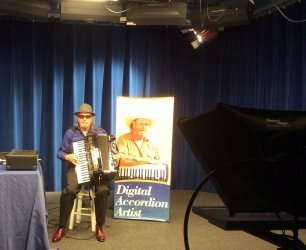 Also included are several photos from the Accordion Cool TV show and from Dave's live performances.